NOTE! This page goes into route details from our trip. If you prefer to know only sketchy details about this area, step away NOW! The map below shows our route somewhat generically. This narrative enters at the bottom and emerges at the top; Deer Meadow is the end of our workout and the Muir Trail there our reward for three hard days of work. Our cross-country tour begins on day two, along the South Fork Kings River. By heading downstream from the JMT where it crosses the South Fork, we picked up the path within five minutes. It comes and goes through downed trees, talus and fast-growing meadowlands. The third patch of talus, and the largest, ends just east of the wooded rise that culminates in the Cartridge Pass lake basin. As DW Donehoo noted to me, a small meadow can be seen through the trees; the South Fork bends left but the meadow was pretty much straight ahead off the talus. The trail never gets reorganized beyond the talus; we hunted a while for it but were pretty exhausted, so we camped a bit further down-river near where a small creek enters the South Fork. The next morning we headed back toward the talus, passing other possible camps between the talus and meadow. Keeping the talus in sight we headed uphill and encountered a small dry streambed that looked very little like a trail; however, as we followed it uphill a clear path (littered with cones and pine needles) began to switchback out of the wash. DW implied that we would see a duck near here, but we didn't see it. We were able to follow this track pretty well, only losing it for brief moments until recovering it within 5-10 yards, usually straight uphill. We lost it at the edge of a higher talus slope not connected to the large one below; this was the point on the old 15-minute map where the trail traverses west into another draw. This draw holds the outlet from the Cartridge Pass lakes, and the sight and sound of the stream are encountered at the end of this traverse. The trail now stays close to the creek up to the larger, lower lake and its beautiful island. Once at the lake the path faded, but after climbing above lake level we saw it again near shore. This is probably NOT the direct route, but we descended to it and followed it until due north of the lake, where we aimed NE and soon recovered another path winding up from somewhere above the east side of the lake. This path climbed to near the highest rockbound lake, then turned due west to the top of a small rise. From there the path turned north, and finally northeast again, to just east of the low point of the pass. 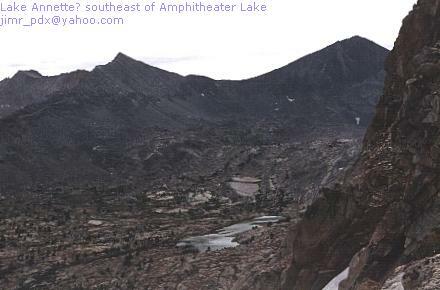 The lowest point was snowbound in '99, somewhat surprising in such a dry year. The route down the north side was entirely made of steep, loose scree, and the switchbacking path has been severely damaged by other previous travelers that took a more direct route. Our advantage of seeing this part of the trail from above was therefore lessened, and we took whatever path seemed most developed while still minimizing the risk of free-fall. After a tough half-hour or so we were on relatively level ground again, following a clear path east of the upper lakes. Shortly after this we lost it again and headed north to regain it; in hindsight it's clear that the path veered west here, not north, but travel was uncomplicated until the bench just above the northern L-shaped lake. We scrambled down with little trouble and camped at a good site by the lake, just below the notch that becomes Dumbbell Pass. Scott surprised me at the bottom of Cartridge Pass. When I asked him how much money it would take to make him cross the pass again, he started the bidding at a cool million. For myself, I figure a year's wages would have been sufficient! Day Four found us on our way late. We arose early to explore Lake Basin, then returned to camp for breakfast, so the packs first hit our backs around 10AM. We reached the top with no trouble worth noting, in less than two hours. The vague path into Lake Basin was gone now; we were seriously into cross-country travel! The pass was beautiful if narrow, but the snowfield on the north side had our attention. Thankfully it was not steep, and the sun had softened it considerably during the morning. We favored the right side on our way down the snow, and this led us into extremely large talus. From the huge blocks we were unable to see more than 20 feet downslope and felt certain that a large dropoff was imminent, so we gently contoured even further right (east). At this point it was quite clear to us that the left side would have served better, a more consistent slope with smaller boulders. We finally headed due north but could see no way to reach the lake in that direction. The clouds were organizing again, and we felt we should get low quickly, so we again veered right - now ESE - and worked our way through scree and talus down to the southernmost part of the eastern lobe of the highest Dumbbell Lake. Faithful to the Secor guidebook, we shunned the east shore of the lake, instead going left along the southern shore. The east side looked no worse than where we had been, so it's hard to say how it compared to our next obstacle. At the narrow part of the high lake we changed into rain gear, which helped cut the freshening breeze. The lake was displaying a maddening tendency to turn left, so each time we rounded a bend we found still more water in front of us. Checking the 15-minute Mt. Goddard topo map showed a contour line brushing against the southern shore of the lake's western lobe, and it proved to be distressingly accurate. We found ourselves physically and mentally exhausted, in dubious but dry weather, confronted by a class-three cliff that blocked our shoreline path. Two minutes of sheer adrenaline-rush followed as we grabbed some well-placed cracks in the granite, hugged the wall, and lowered ourselves five feet onto a narrow shelf that eventually led down to the water's edge. After another well-earned break, we were nearing the end of the agonizing journey around the lake at last! Having finally reached the outlet stream, we rested and examined the valley for a good camp that would not cost us much elevation. We set out north toward the largest trees in sight, but they were insufficient for protection from the elements. We continued on to a point near the end of the long northernmost lake, where whitebark pines and level ground combined for some great campsites. It felt very good to put down the packs, and the Dumbbell Lakes basin was a beautiful sight even in the raw, but still dry, evening. Looking back at the west side of the uppermost lake, it's not at all clear that staying above the lake from the pass would stay anywhere near class two; the route we took was uncomfortable but not unduly punishing. Day Five would see us reach the Muir Trail, but it was hardly the anti-climax we had hoped for! We hit the 'trail' by 8AM and found the going to be easier than we expected, and Cataract Pass was reached less than an hour from camp. We felt unbeatable at that point - then Scott looked over the north side and was greeted by the near-vertical reality of the north side. A snow field was in fact vertical here, and cliffs further east left nowhere to begin but on the far left, just where Secor and Bill Finch had suggested. The view was incredible from this pass, though the cold wind and fast-moving mid-level clouds kept us from relaxing long here. The route we took went left, dropped swiftly, then cut across the snowfield at a relatively level spot where the snow followed two ways around a large rockpile. Now right (ESE) of the snow, we went left over moderately large talus and aimed for a patch of green that from here appeared to overhang the lake. The high lake SE of Amphitheater Lake sparkled in the beautiful valley, and I dropped my pack and fished out the camera to capture it. Once we reached the green patch, I shot a picture back the way we came, then moved right and down a short way, then switchbacked down to the shore, where more large talus awaited. With plenty of recent experience under our belts, we negotiated our way above the shoreline, and finally dropped our packs by the lake after two hours' hard work. We were amazed at how anyone decided that this was a functional route; from the lake it appears to be a minimal, snow-choked notch leading nowhere. Despite our recent hard work, we still had 2000 vertical feet to lose before reaching Palisade Lake, and no clear route to get us there. 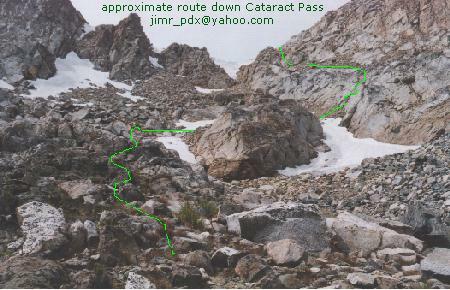 The easy travel consisted of granite ramps that sloped away from, then back toward, Cataract Creek, which was noisily taking the direct route downslope. We could see that substantial cliffs awaited below, above the meeting of the two forks of the creek, and we moved farther right to avoid the trouble. We seemed to find enough trouble in that direction, but as we loudly questioned our choice of routes a beacon appeared high on our right. It was a rather large duck, a hopeful sign at that moment, and we scrambled over to it through talus and willow-bushes. The view down wasn't much of an improvement, but a steep draw pulled us down, then right, then finally down over large talus to the small pond where the two streams meet. On the west side of the pond was a clear path: at last!